Ramsey Island is home to a wide range of wildlife; small and large, rare and common. 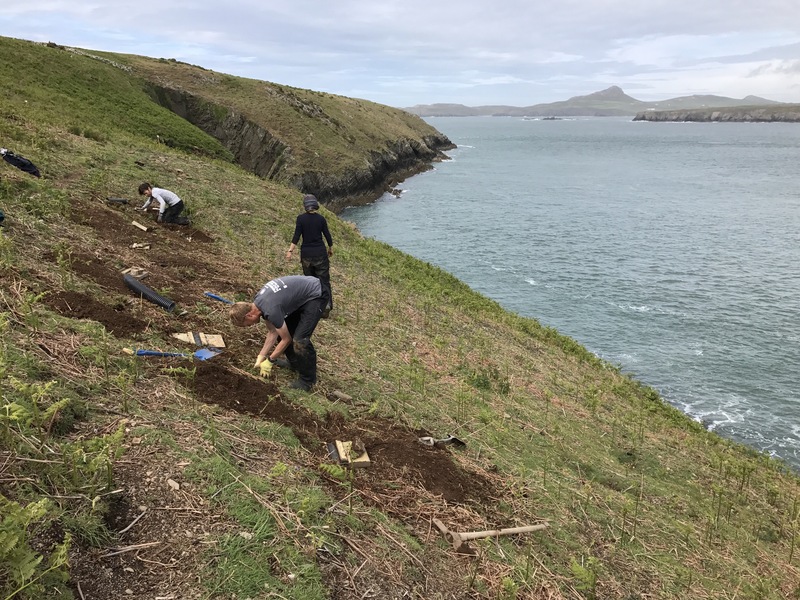 At present, however, significant efforts are going into, literally, making homes for one particular species; Manx Shearwaters. When Ramsey was bought by the RSPB in 1992, there were only around 500 pairs of Shearwaters nesting on the island. The presence of rats had reduced the numbers of this species, and of other ground nesting birds, to levels far below those on the nearby rat-free islands of Skomer and Skokholm. Back in the winter of the turning millennium, a successful rat eradication exercise was undertaken on the island. Since then, the benefits of doing so have shown in the increasing numbers of ground and burrow nesting birds. The last survey of Shearwaters, undertaken last year, and ‘helped’ by me, revealled that the upward trend was continuing with nearly 5,000 pairs recorded. Whilst the increasing numbers of Shearwaters is very positive news, there’s still much work to do. 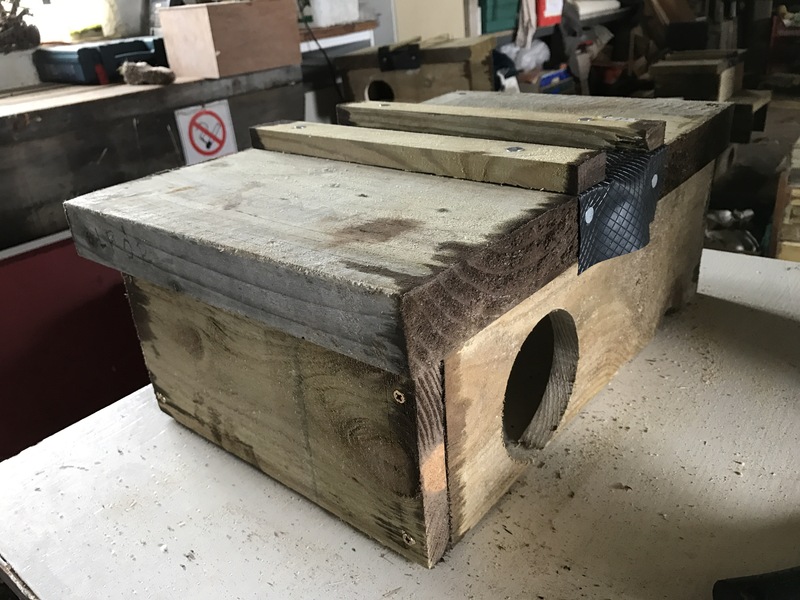 Monitoring the population remains a key activity for the RSPB on Ramsey and this task is made easier by constructing nest boxes through which easier access can be gained to the birds while they are breeding. The birds usually nest at the far end of rabbit burrows and this makes them tricky to get of off but the nest boxes, with a door in the roof, make the job very simple. The monitoring includes checking on the health of the birds as well as ringing them. 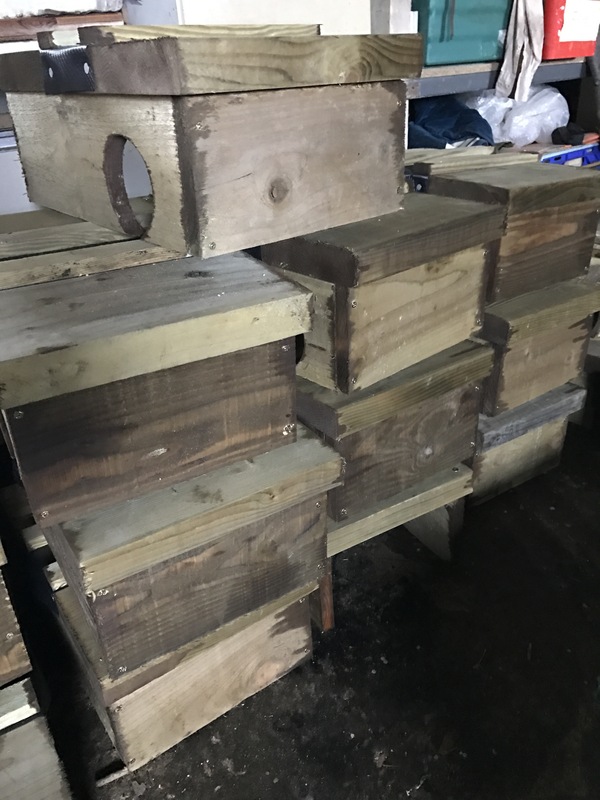 One of my first jobs on the island this time was to help make nest boxes, some of the 100 to be installed on the island’s sheltered east coast. They’re relatively simple wooden boxes to build, with three of the four sides enclosed, one of the longer sides having a round hole cut into it, no bottom, and a thick roof, one half of which is hinged to give access for monitoring. Once installed, the round hole is fitted with a three-foot long tube through which the Shearwaters reach the nest chamber. In total, I put together 11 boxes and they’re now waiting to be installed. During the last couple of afternoons, we’ve spent a while out on that east coast and installed more than a dozen boxes. The installation is also quite straightforward but requires a bit of hard graft. A hole just large enough to ‘plant’ the box is dug in the sloping side of the island, deep enough for the front of the box to be nearly flush with ground level. 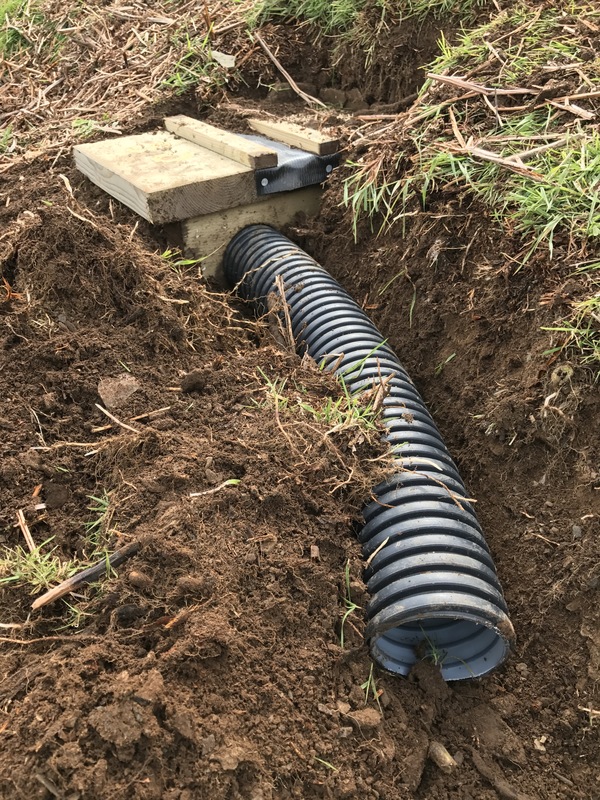 With the box in place, a channel is dug from the hole in the side and the is tube installed. All that is required then is for the back half of the box and the tube to be covered with soil and the job is nearly done. 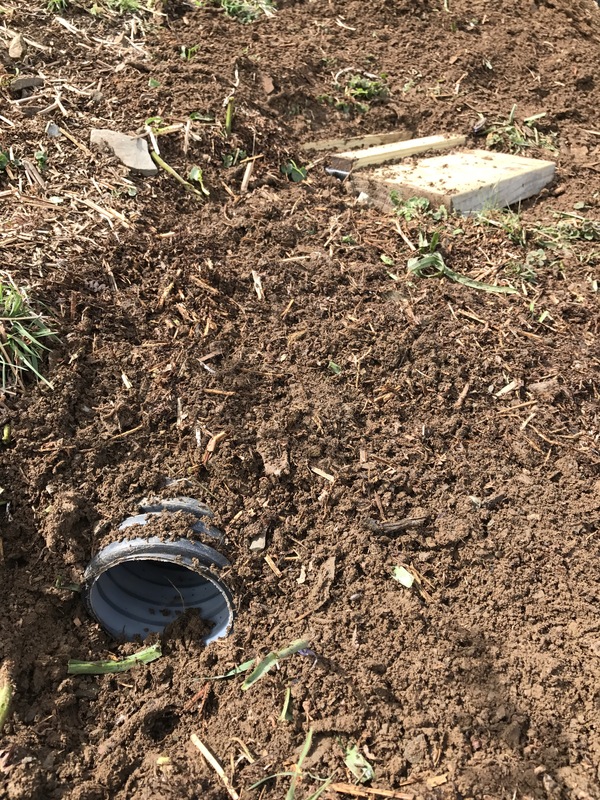 The last touches are to put some soft nesting material on the bare earth beneath the box and put up a small piece of bracken at the box end of the entrance tube; if this gets knocked over, it’s a tell-tale that the box has been visited by a Shearwater (or one of those pesky rabbits). I’ve installed four boxes so far, and they’re more to be done. One of the aspects of a stay on Ramsey that makes it so special is lying in bed on a dark night and listening to the odd chuckling and gurgling sounds of the Shearwaters as they come back from the sea and head to the burrows. Hopefully, making homes for them will help to play a role in further increasing their numbers and make the nocturnal sounds on the island even more special.